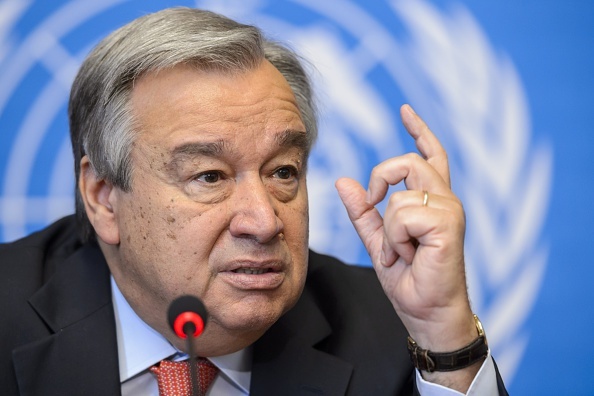 United Nations High Commissioner for Refugees (UNHCR) Antonio Guterres, credit: F. Coffrini/AFP/Getty Images. This is a primarily refugee crisis, not only a migration phenomenon. The vast majority of those arriving in Greece come from conflict zones like Syria, Iraq or Afghanistan and are simply running for their lives. All people on the move in these tragic circumstances deserve to see their human rights and dignity fully respected, independently of their legal status. But we cannot forget the particular responsibility all states have vis a vis refugees, in accordance with international law. Europe cannot go on responding to this crisis with a piecemeal or incremental approach. No country can do it alone, and no country can refuse to do its part. It is no surprise that, when a system is unbalanced and dysfunctional, everything gets blocked when the pressure mounts. This is a defining moment for the European Union, and it now has no other choice but to mobilize full force around this crisis. The only way to solve this problem is for the Union and all member states to implement a common strategy, based on responsibility, solidarity and trust. Concretely, this means taking urgent and courageous measures to stabilize the situation and then finding a way to truly share responsibility in the mid to longer term. The EU must be ready, with the consent and in support of the concerned governments – mainly Greece and Hungary, but also Italy – to put in place immediate and adequate emergency reception, assistance and registration capacity. The European Commission should mobilize the EU asylum, migration and civil protection agencies and mechanisms for this purpose, including the resources of member states and with the support of UNHCR, IOM and civil society. From our side, UNHCR is fully committed to step up its efforts. It is essential that refugee families that disembark in Europe after having lost everything are welcomed into a safe and caring environment. People who are found to have a valid protection claim in this initial screening must then benefit from a mass relocation programme, with the mandatory participation of all EU member states. A very preliminary estimate would indicate a potential need to increase relocation opportunities to as many as 200,000 places. This can only work if it goes hand in hand with adequate reception capacities, especially in Greece. Solidarity cannot be the responsibility of only a few EU member states. The only ones who benefit from the lack of a common European response are the smugglers and traffickers who are making profit from people’s desperation to reach safety. More effective international cooperation is required to crack down on smugglers, including those operating inside the EU, but in ways that allow for the victims to be protected. But none of these efforts will be effective without opening up more opportunities for people to come legally to Europe and find safety upon arrival. Thousands of refugee parents are risking the lives of their children on unsafe smuggling boats primarily because they have no other choice. European countries – as well as governments in other regions – must make some fundamental changes to allow for larger resettlement and humanitarian admission quotas, expanded visa and sponsorship programmes, scholarships and other ways to enter Europe legally. Crucially, family reunification has to become a real, accessible option for many more people than is currently the case. If these mechanisms are expanded and made more efficient, we can reduce the number of those who are forced to risk their lives at sea for lack of alternative options. Beyond the immediate response, it is clear that this situation will require us to reflect seriously about the future. This massive flow of people will not stop until the root causes of their plight are addressed. Much more must be done to prevent conflicts and stop the ongoing wars that are driving so many from their homes. The countries neighbouring war zones, which shelter 9 in 10 refugees worldwide, must be supported more strongly, along with the funding required. At the same time, it is also essential that development cooperation policies are reoriented with the objective of giving people the opportunity to have a future in their own countries. Précédent Nos enfants nous jugeront sur les murs que nous avons érigés à nos frontières.